One of the most exciting aspects of being a firefighter is the variety of tasks we get to be involved in and the amount of disciplines we have the opportunity to learn. At the firefighter rank, my responsibilities include but are not limited to, working as part of a team to provide emergency and non-emergency services to the citizens and visitors of the LFRA district. 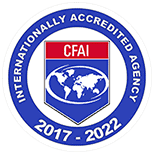 LFRA is committed to providing quality service to the community. We respond to a variety of calls for service, including structure fires, wildland fires, motor vehicle accidents, and emergency medical calls. 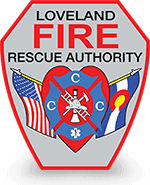 LFRA also provides special operation services like water rescue, rope rescue, large animal rescue, and more. As part of the special operations, the organization will deploy resources nationally to assist with disaster response. 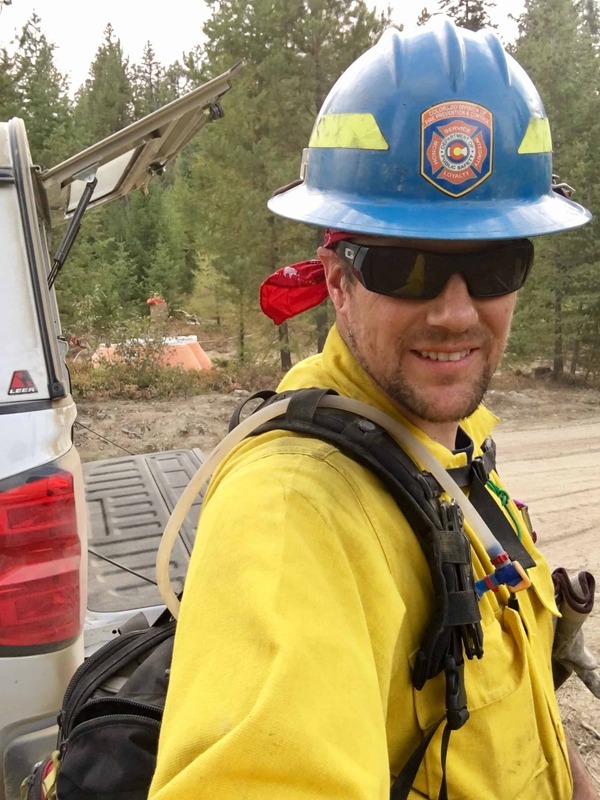 In August 2017, I was deployed as part of a team to assist with multiple wildfires burning in Montana. I was one of nineteen people that formed a hand crew led by the Colorado Division of Fire Prevention and Control (DFPC). At that time (there were more than five large fires burning in Montana and even more in other states) resources were slim nationally. The crew I deployed with is called the Overland Crew based out of Fort Collins. 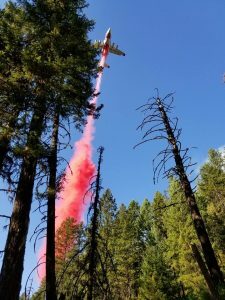 The Crew Boss received a resource order on August 17th requesting assistance with one of the fires burning in Montana. Personnel met at the DFPC facility in north Fort Collins that afternoon and prepared to make the drive to Missoula, Montana. Personnel and firefighting equipment was transported in five pickup trucks. The drive took two and a half days. During the drive, the Crew was reassigned to a fire a few hours north of Missoula in Libby. On August 19th we arrived at the incident command post (ICP) in Libby. We were given our orders and went to work on the fire line that afternoon. 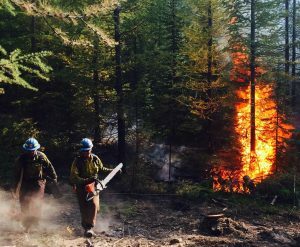 The Overland Crew was assigned a portion of the 300 acre Tamarack Fire. The fire had been started by a lightning strike several days previously. 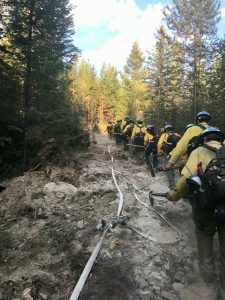 The crew’s objective was to continue containment and extinguishment efforts on the north flank of the fire. That night we returned to the ICP to be fed and set up camp. The Overland Crew was assigned to the Tamarack Fire for eleven days. Our days started at 5:30 am and ended at 10:00 pm. We started the day by hiking into the fire. The terrain was steep and deep in a thick forest filled with trees towering hundreds of feet in the air. Each day we worked with hand tools, chainsaws, and water to build fire lines and extinguish spot fires. These were long hard days with little down time. In the second week, the fire was contained and operations started to die down. Some of the 350 people assigned to the fire were being reassigned to other fires and the command structure was transitioned to a smaller team. The Overland Crew remained on the Tamarack Fire into the second week. The days and work load maintained the same pace, but the objective changed slightly. The crew had to ensure that all the fire and heat at the interior of the fire was mitigated. On the 11th day, the Overland Crew was reassigned to another fire in the area. 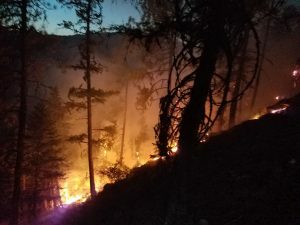 This fire was named the West Fork Fire and was a new start that day. The crew was requested for initial attack. Access to this fire was even more of a challenge and could only be made on foot. The fire was burning at the top of very steep terrain. Due to the location of the fire a significant amount of air resources were assigned to assist with extinguishment. 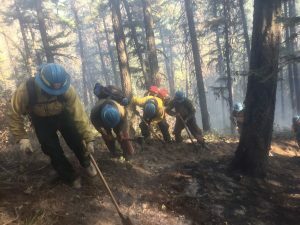 The crew spent our remaining three days working the West Fork Fire. After 14 days in Montana, we were demobilized and started the drive back to Colorado. I was away from my family 18 long days. This experience has taught me valuable lessons and I built lasting relationships with members of the crew. I am able to apply the lessons I learned and continue to have opportunities to learn more through experiences like this.